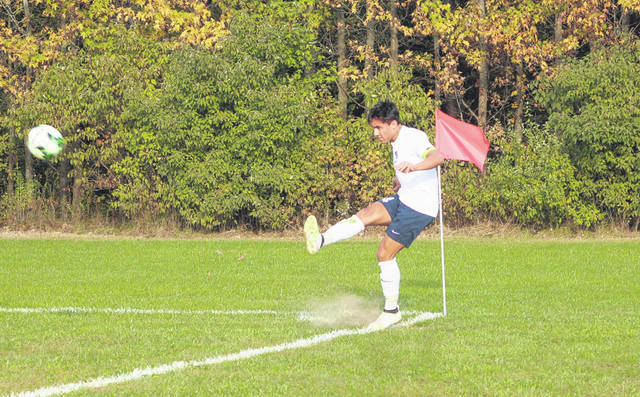 Josh Kidder of Archbold with a corner kick in a match this season. For the third straight season, Kidder was chosen the player of the year in the NWOAL. 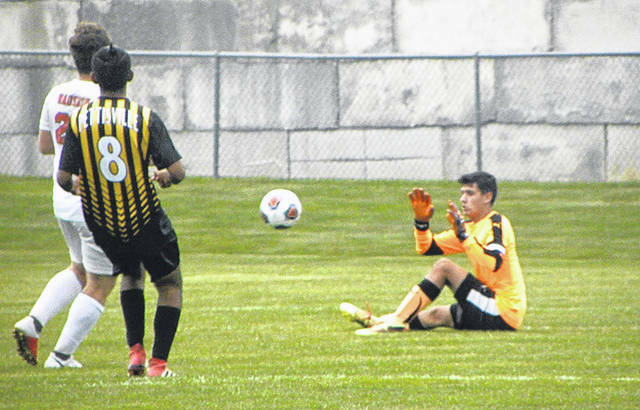 Wauseon goalkeeper Easton Delgado makes a save versus Pettisville this season. He was named first team all-league by the NWOAL. Area boys were honored on the Northwest Ohio Athletic League all-league soccer list that came out recently. For the third straight season, Archbold’s Josh Kidder was awarded player of the year honors while his mentor, Sean Stewart, was the league’s coach of the year. Also on the first team for Archbold were Andrew Hogrefe and Elijah Zimmerman. Second team all-league for the Bluestreaks were Trey Theobald, Chase Kohler, and Clay Gerig. Making first team all-league for Delta was Kaden Pirrwitz. Tyler McCullough and Nick Gardelli were second team all-league for the Panthers. Riley Hensley and Zach Schaller of Swanton also made the first team. On the second team for the Bulldogs were Cole Mortemore and Donovan Avalos. For Wauseon, Easton Delgado and Chase Soltis were first team all-league. Ethan Glover was second team all-league for the Indians. Josh Kidder, sr., Archbold; Andrew Hogrefe, sr., Archbold; Parker Strauss, sr., Liberty Center; Riley Hensley, jr., Swanton; Brendan Reiser, jr., Bryan; Orry Killam, sr., Liberty Center; Elijah Zimmerman, jr., Archbold; Kaden Pirrwitz, sr., Delta; Tyler Manon, jr., Bryan; Zach Schaller, sr., Swanton; Easton Delgado, soph., Wauseon; Chase Soltis, jr., Wauseon. Coach of the Year: Sean Stewart, Archbold. Trey Theobald, soph., Archbold; Weston Kundo, sr., Liberty Center; Chase Kohler, jr., Archbold; Tyler McCullough, sr., Delta; Adam Wells, jr., Liberty Center; Cole Mortemore, jr., Swanton; Zach Seaman, soph., Bryan; Reese Jackson, jr., Bryan; Clay Gerig, sr., Archbold; Donovan Avalos, sr., Swanton; Nick Gardelli, jr., Delta; Ethan Glover, jr., Wauseon. Archbold: Cameron Collins, Ethan Hagans, Sonson Nafziger, Noah Cheney, Javier Peche. Delta: Kaleb Circle, Payton Webster. Swanton: Wyatt Lake, Johnny Noegel. Wauseon: Jacob Hageman, Logan Richer.